When we were younger, we thought Chekov's Uncle Vanya was a bittersweet domestic farce. As we've aged, we've come to see it as vice versa: a terrible tragedy dressed up as comedy. A difficult emotional pitch to achieve but, when you get it right, boy, it's a zinger. 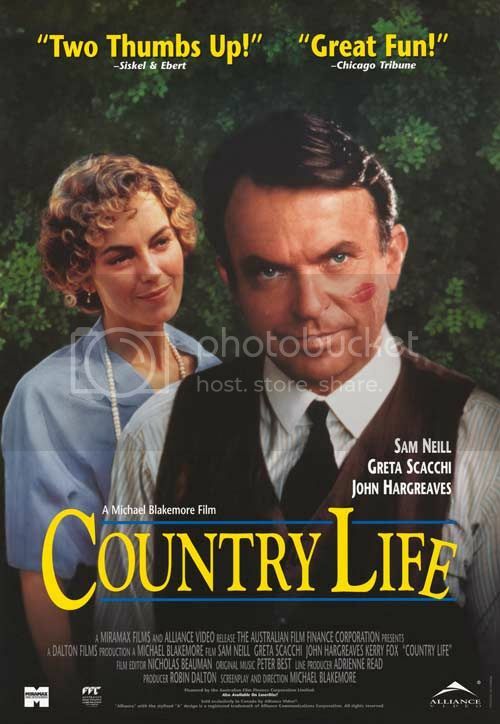 Country Life explores the terribly farcical tragicness of being deeply in love with Sam Neill when he has no idea that you exist. Le sigh. It's also about other stuff - such as a depressed uncle - but the existential jist is really captured in this love non-affair. Because, forsooth, we all have our broken flowers, our expired dreams, our Sam Neills. And this sense of lost opportunities, of waning vitality and fuzzy regrets, remains lodged in our hearts forever - how can we but look back to the halcyon days of Jurassic Park to the tragic detour of Event Horizon, and on into the gloomy twilight of... what has Sam Neill been in recently? Oh yeah, Under the Mountain. Anyway, how can we not look back on this, here now in gloomy twilight, and pine for those majestic days of golden yore, when Sam Neill sailed the high seas and punched Billy Zane in the head and was really, really awesome and hot? When Alexander Voysey (Michael Blakemore, who also directs) and his much younger wife Debbie (Greta Scacchi) return from England to his Outback birthplace, they throw the family home all askew. Voysey - a pompous lecher and waning art critic - annoys everyone with his high falutin', limp-wristed snobbery, while his wife - a melancholy waif - beguiles all the ruddy Australian men. In particular, the volatile, flamboyant Uncle Jack (John Hargreaves) and the hard-drinking, idealistic pacifist Doctor Askey (Sam Neill!!!). This, while Uncle Jack's hard-working niece, Sally (Kerry Fox), harbors an intense crush on the good doctor. Things get complicated when Askey, by the sheer brilliance of his Sam Neilliness (and a charming sequence where he gets punched in the nose for his pacifist troubles), beguiles Debbie back. Meanwhile, this all happens in 1919 Australia, the first summer after the war, against a backdrop of a wounded generation (literally) limping back home. There are parts of Country Life that work really well, and parts that clang and plod. It also suffers from that weird problem when not all the actors are on the same page about the tone of the film. Blakemore is great as the fussy, infuriating Voysey, but - if his pitch is anything to go by (and we guess it is, given that he directed) - he seems to lean heavily towards comedy. John Hargreaves gives an intense, almost maniacal performance that can best be described as slapstick tragedy. Kerry Fox is understated and gut-wrenching as the "ugly duckling" Sally, and Sam Neill... well, just acts like he's in a Sam Neill movie. This all comes together quite nicely in some sequences - such as when Sally half-confesses her love to a half-drunken Askey and gets a heartbreaking half-rejection in reply - but it falls apart more often than not. The characterizations are a bit too flimsy to get a good emotional depth going, and gesturing towards archetypes or caricatures isn't enough. This is the sort of story that requires a Jeff Daniels-esque feat of a rich, warts-and-all portrait. So, ultimately, the strength of the story is driven mostly by Chekov and our particular Sally-like love of Sam Neill, rather than any innovation or brilliance in this adaptation. Also, be warned: the soundtrack is so, so bad. It's like MIDI elevator music or something.